A merry, merry Christmas and the happiest of happy holidays to all of my family and friends and all you quiet folk out there! Hope everyone gets just what their little hearts desire - for me it's the excitement of watching my kids pull treats out of their stockings and then rip into their gifts and having the whole day to catch up with family near and far and eat, eat, eat. Such a perfect way to see out what has been a fantastic year! I'll be back early in the new year with my usual list of plans and schemes and perhaps a little sale to see in 2013. Have a good, safe, happy one, folks! You're so cute! Merry Christmas! 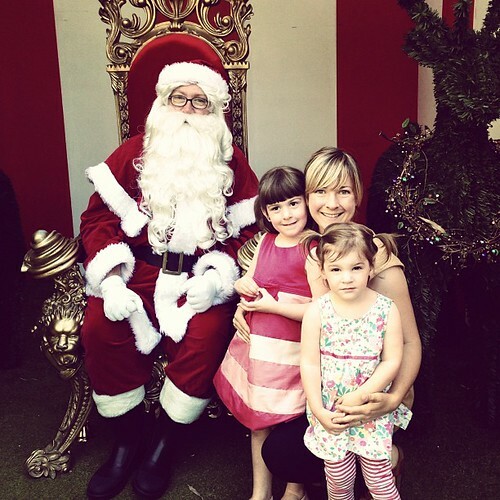 Gorgeous photo of the and the girls L - silly question though, is that Santa a lady?